A number of United Kingdom (and Isle of Man and Channel Islands) food and drink products have been granted Protected Geographical Status under European Union law. The purpose of the scheme is to protect the reputation of regional products, promote traditional and agricultural activity and to eliminate non-genuine products, which may mislead consumers or be of inferior or different character; for example, producers cannot refer to their product as Scotch whisky unless it has been produced within Scotland, following particular methods. There are three schemes of geographical indications, "protected designation of origin" (PDO), "protected geographical indication" (PGI), and "traditional specialities guaranteed" (TSG), which are designed to promote and protect names of quality agricultural products and foodstuffs. The United Kingdom has a total of 65 products with protected status, relatively few when compared with Portugal (125 protected status products), France (217) and Italy (267). Several countries, however, including Ireland (5), Sweden (6) and Austria (14), have a considerably lower count. Most of the products hold either PGI (38) or PDO (25) status, with only two products being designated as TSG. This list, excepting "spirit drinks", is compiled according to the Database of Origin and Registration and E-Bacchus, European Commission databases of all registered products, as well as all products which were formerly registered or for which registration has been applied. The majority of products that hold protected status are foodstuffs fit for human consumption, including cheeses (15), fresh meat and offal (13), meat products (4), fish and molluscs (10), fruit and vegetables (6), wines (4) and spirit drinks (3). While other agricultural products can be included, native Shetland wool is the only non-edible product to hold protected status in the UK. The schemes were introduced in 1993, although they are now governed by Regulation (EU) No 1151/2012 of the European Parliament and of the Council, which was introduced in 2012, in part to overhaul and regulate the protected status system. Spirits, fortified wines and aromatised wines, described by the European Commission as "spirit drinks", are governed by a separate regulation, Regulation (EC) No 110/2008 of the European Parliament and of the Council. Protected Designation of Origin (PDO): this designation covers products that are "produced, processed and prepared" in a specific area, using a particular, usually traditional, method. Protected Geographical Indication (PGI): this designation covers products whose "production, processing or preparation" takes places in a specific area. Traditional Speciality Guaranteed (TSG): this designation covers products with a "traditional character" or "customary names", distinguishing them from similar products. Unlike PDO and PGI, these products do not need to be connected to a specific area or method of production. In order to be considered for TSG status, a product must demonstrate that the materials and methods used in its production has been consistent for a minimum of 30 years. The categorisation below is based on the format used in the Database of Origin and Registration and E-Bacchus databases. PDO 2008 Limited to products produced, processed and prepared on the Isle of Man, using traditional methods. Products should be produced from lambs grazed on unimproved land and if supplementary feed is needed this should be sourced from locally grown grain. PDO 2013 Limited to products produced, processed and prepared in Cumbria. Products must be produced from sheep grazed locally and any supplementary feed should be sourced in Cumbria. Lakeland Herdwick lamb must be slaughtered between 8 and 12 months of age. PDO 1996 Limited to products produced and reared on Orkney, using traditional methods. The cattle must be slaughtered and prepared on Orkney. PDO 1996 Limited to products produced and reared on Orkney, using traditional methods. The lambs must be slaughtered and prepared on Orkney. PGI 2004 Limited to products produced in Scotland, including the Outer Hebrides, Shetland and Orkney. Products must be produced from cattle reared, slaughtered and dressed in Scotland. PGI 2004 Limited to products produced in Scotland, including the Outer Hebrides, Shetland and Orkney. Products must be produced from sheep reared, slaughtered and dressed in Scotland. PDO 1996 Limited to products produced, processed and prepared on Shetland, using traditional methods. Products must be produced from lambs no more than 12 months old at the time of slaughter. TSG 2000 The product is described as being superior in quality to standard turkeys. In order to be described as such the product must be produced using a specific method which includes using only birds which are over 20 weeks old, have been dry plucked, hung to mature and eviscerated after this period of hanging. TSG 2010 In order to be designated as such the product should be from Gloucestershire Old Spots, described as "traditional unimproved breeds". The animals should be reared using traditional farming methods, including allowing the meat to mature on the bone for several days. The designation refers to all products of the pig, including bacon, gammon, sausages etc. PGI 2002 Limited to products from cattle that are born and reared in Wales. Products must come from cattle that have not bred. PGI 2003 Limited to products that are produced from lambs born and reared in Wales. PGI 2014 Limited to products that are produced from lambs born and reared in the West Country (Cornwall, Devon, Dorset, Gloucestershire, Somerset and Wiltshire). Products must be no more than 12 months old at the time of slaughter. PGI 2014 Limited to products produced from cattle born, reared and processed in the West Country (Cornwall, Devon, Dorset, Gloucestershire, Somerset and Wiltshire). Products must have a diet of at least 70% forage. PGI 2008 Limited to products produced using a traditional recipe and within the vicinity of Melton Mowbray. PGI 2012 Limited to products produced within the vicinity of Newmarket. Products must have a meat content of at least 70% and be made from prime cuts of meat from the belly or shoulder. PGI 2013 Limited to products produced using a traditional recipe with a prescribed ratio of ingredients and within the vicinity of Isle of Lewis and "the surrounding 'Stornoway Trust' area". PGI 2011 Limited to products produced in Cumbria. Products must have a meat content of at least 80% and be sold coiled, rather than linked. PDO 2007 Limited to cheese produced, processed and prepared in the Fylde area of Lancashire, including Preston and Blackpool. Products must be made from full fat cows milk and contain 48% butter fat, using traditional methods. PDO 1996 Limited to cheese produced, processed and prepared within a 90 km radius of the summit of Peel Fell. Products must be made from full fat Jersey cow milk, with a minimum fat content of 20% and a maximum water content of 60%, using traditional methods. PDO 1996 Limited to cheese processed and prepared within a 30 km radius of Buxton and using milk from cows grazed in Derbyshire and the surrounding counties, using traditional methods. PGI 1998 Limited to cheese produced, processed and prepared in Dorset. The product must be made from unpasteurised, skimmed milk from cows grazed in the Blackmore Vale. PDO 1996 Limited to cheese produced, processed and prepared within an 80 km radius from Dovedale, using whole milk from cows grazed in the surrounding counties of Derbyshire, Nottinghamshire and Staffordshire. The product must be produced using traditional methods. PGI 1999 Limited to cheese produced in west Somerset, using traditional methods. The product must be made using Jersey cow milk, with a typical composition of 49% water and 34% fat. PGI 2013 Limited to cheese produced on Orkney, using milk from locally grazed cows. PDO 1996 Limited to cheese produced, processed and prepared in Gloucestershire, using traditional methods. The product must normally be produced from either pasteurised or unpasteurised Gloucester cows' milk. However, when this is not possible, milk from other breeds grazed in Gloucestershire can be used. PDO 2007 Limited to cheese produced, processed and prepared within the country of Staffordshire, using traditional methods. The product must be made from milk from cows grazed in Staffordshire or on silage sourced there. PDO 1996 Limited to cheese produced, processed and prepared in the Swaledale Valley, North Yorkshire, using traditional methods. The product must be made from full fat cows' milk, from cows grazed in the designated area. The product must contain a minimum fat content of 48% and a maximum water content of 48%. PDO 1996 Limited to cheese produced, processed and prepared in Leicestershire, Derbyshire and Nottinghamshire, using traditional methods. The product must normally be made using full-fat pasteurised cows' milk from cows grazed in the designated area. However, if this is not readily available this may be sourced from the surrounding counties of Cambridgeshire, Northamptonshire, Warwickshire, Staffordshire, Greater Manchester, Cheshire, Yorkshire and Lincolnshire. Both cheeses must have a minimum fat content of 48%. PDO 1996 Limited to cheese produced, processed and prepared in the Swaledale Valley, North Yorkshire, using traditional methods. The product must be made from full fat ewe milk, from sheep grazed in the designated area. PGI 1998 Limited to cheese produced within a 90 km radius of the summit of Peel Fell. The product must be produced using unpasteurised whole milk from Jersey cows. The product must have a minimum fat content of 48% and a maximum water content of 48%. PDO 1996 Limited to cheese produced, processed and prepared in Dorset, Somerset, Cornwall and Devon, using traditional methods. The product must normally be made from pasteurised cows' milk from cows grazed in the designated area. However, when this is not readily available milk may be used from the bordering counties of Gloucestershire and Wiltshire. PGI 2013 Limited to cheese produced in Wensleydale, North Yorkshire. The product must be produced using whole milk from cows grazed in the designated area, which can be both pasteurised or unpasteurised. PDO 1998 Limited to products produced, processed and prepared from milk produced in Cornwall and containing a minimum butterfat content of 55%. PGI 2012 Limited to apples grown within the Archdiocese of Armagh, Northern Ireland (covering Counties Tyrone and Armagh and parts of County Londonderry). Products must be harvested between early September and late October. PGI 2013 Limited to celery that has been produced in prescribed parishes in The Fens. The product must be grown on the "Adventurers 1 and 2 soil series 'deep peat soil which is naturally very fertile, deriving partially decomposed plant remains that accumulated under waterlogged conditions'", using traditional or commercial methods. PDO 1996 Limited to potatoes grown, prepared and processed on the island of Jersey, using traditional methods. PGI 2012 Limited to potatoes produced in an area bounded by Ardkeen in the south, Crossgar and Killyleagh in the west and Castlereagh, North Down and Belfast in the east. The product must be planted in January and harvested between early May and late July. PGI 2013 Limited to potatoes grown in Pembrokeshire. The product must be planted in early February and harvested between May and late July. PDO 2010 Limited to rhubarb produced within the Rhubarb Triangle (an area between Leeds, Wakefield and Bradford). Products must be produced using traditional methods. PGI 2004 Limited to products produced within "a coastal corridor with an inland boundary 8 kilometres radius from Arbroath Town House and extending to the community of West Mains in the north and the community of East Haven in the south" and purchased at designated Scottish fish markets. Products must be produced using traditional methods. PGI 2009 Limited to sardines that have been caught within an area no more than six miles off the Cornish coast. Products must be landed and processed within Cornwall. PDO 2013 Limited to oysters that have been caught within the Truro Port Fishery ("all those parts of the Truro and Falmouth Harbours and of the bed of the Truro, Fal and Tresillian rivers containing an area of 2721 acres") using traditional vessels. Products must be caught between October 1 and March 31. PDO 2012 Limited to queen scallops that have been caught within the territorial waters of the Isle of Man. PGI 2011 Limited to eels caught in Lough Neagh, Northern Ireland and the lower River Bann, using traditional methods. Yellow eels (immature Anguilla anguilla) must be caught between 1 May and 8 January. Silver eels (mature Anguilla anguilla) must be caught between 1 June and 28 February. PGI 2008 Limited to Atlantic salmon that have been "conventionally and organically" farmed on the west coast of Scotland, the Western Isles, Orkney and Shetland. PGI 2012 Limited to Atlantic salmon caught up to 1500 metres from the coast of Scotland, using prescribed methods. PGI 2009 Limited to fish that have been prepared and smoked in Grimsby, North East Lincolnshire, using a traditional method. Products must be either cod or haddock and weigh between 200g-700g. PGI 2013 Limited to Atlantic salmon that have been caught in specific tidal areas of the River Tywi, the River Taf and the River Teifi. Products must be caught using traditional coracle fishing methods. PGI 1997 Limited to oysters caught on oyster beds in the vicinity of Whitstable, Kent. The product can include both the species Ostrea edulis and Crassostrea gigas. PDO 2014 Limited to sea salt prepared, processed and produced in the Menai Strait, using traditional methods. PDO 2013 Limited to hops prepared, processed and produced in a specific area of Kent, which includes the settlements "Tonge, Lynsted, Norton, Teynham, Buckland, Stone, Ospringe, Faversham, Boughton-under-Blean, Selling, Chartham, Chilham, Harbledown, Canterbury, Bekesbourne, Bridge, Kent and Bishopsbourne", using traditional methods. PGI 1996 Limited to cider and perry produced in Gloucestershire, using locally grown varieties of perry pears and cider apples. PGI 1996 Limited to cider and perry produced in Herefordshire, using locally grown varieties of perry pears and cider apples. PGI 1996 Limited to products produced in Worcestershire, using locally grown varieties of perry pears and cider apples. PGI 1996 Limited to ale produced within Kent using traditional methods. Products must have an abv between 3.5% and 6.0%. PGI 1996 Limited to bitter produced, processed and prepared within Rutland and Leicestershire, although packaging can take place elsewhere. PGI 2011 Limited to products produced in Cornwall using a traditional recipe, with at least 12.5% beef and 25% vegetable content. Products can still be finally baked outside of the designated production area. PDO 2011 Limited to products produced on Shetland, using traditional methods. Products must come from pure bred Shetland sheep who have been grazed organically on Shetland. PDO 2011 Limited to wine produced in England from grapes grown in the designated area, using prescribed methods. Products must use grapes from vines growing at a height below 220 metres above sea level. The product may be vinified outside of the designated area provided it is contiguous to England and prior authorisation has been granted from the Food Standards Agency. The product must conform to restrictions regarding alcohol content, acidification and sweetening. PGI 2011 Limited to wine produced from grapes grown in England, although production does not have to be within a certain area. The product must conform to restrictions regarding alcohol content, acidification and sweetening. PDO 2011 Limited to wine produced in Wales from grapes grown in the designated area, using prescribed methods. Products must use grapes from vines growing at a height below 220 metres above sea level. The product may be vinified outside of the designated area provided it is contiguous to Wales and prior authorisation has been granted from the Food Standards Agency. The product must conform to restrictions regarding alcohol content, acidification and sweetening. PGI 2011 Limited to wine produced from grapes grown in Wales, although production does not have to be within a certain area. The product must conform to restrictions regarding alcohol content, acidification and sweetening. PGI 2008 Limited to whisky that is produced on the island of Ireland. [n 1] The final product must not be sweetened or flavoured, other than the addition of plain caramel as a colouring. The product must have an abv of at least 40%. PGI 2008 Limited to gin that is produced in Plymouth. The product must have a minimum abv of 37.5%. and have a predominantly juniper flavour. PGI 2008 Limited to whisky that is produced in Scotland. The final product must not be sweetened or flavoured, other than the addition of plain caramel as a colouring. The product must have an abv of at least 40%. PGI 2000 Until 2007, limited to beer brewed within the city of Newcastle-upon-Tyne. The restrictions were lifted on request of the sole producer, Scottish & Newcastle, when production was moved to Gateshead, outside of Newcastle-upon-Tyne. ^ The protected geographical indication for Irish Whiskey/Uisce Beatha Eireannach/Irish Whisky covers both the Republic of Ireland and Northern Ireland. ^ a b Database of Origin and Registration. n.d.
^ a b c d Geographical indications and traditional specialities 2014. ^ Database of Origin and Registration n.d.
^ a b c Protected food names: guidance for producers 2014. ^ EU agricultural product quality policy 2014. ^ Regulation No 110/2008 of the European Parliament and of the Council 2008, p. 16-54. ^ New framework for Quality schemes in agriculture enters into force 2013. ^ Database of Origin and Registration (DOOR) n.d.
^ Council Regulation (EEC) No 2081/92: Isle of Man Manx Loaghtan Lamb 2007. ^ Council Regulation (EC) No 510/2006 on protected geographical indications and protected designations of origin: Lakeland Herdwick 2007. ^ Product Specification: Orkney Beef 2007. ^ Product Specification: Orkney Lamb 2007. ^ Council Regulation (EC) No 510/2006 on protected geopgraphical indications and protected designations of origin: Scotch Beef 2007. ^ Council Regulation (EC) No 510/2006 on protected geopgraphical indications and protected designations of origin: Scotch Lamb 2007. ^ Product Specification: Shetland Lamb 2007. ^ Application for registration of a TSG: Traditional farmfresh turkey 2007. ^ Application for registration of a TSG: Traditionally Farmed Gloucestershire Old Spots Pork 2007. ^ Product Specification: Welsh Beef 2007. ^ Council Regulation (EC) No 510/2006 on protected geographical indications and protected designations of origin: Welsh Lamb 2007. ^ Application to register: West Country Lamb 2007. ^ Application to register: West Country Beef 2007. ^ Council Regulation (EC) No 510/2006: Melton Mowbray Pork Pie 2007. ^ Council Regulation (EC) No 510/2006 on protected geographical indications and protected designations of origin: Newmarket Sausage 2007. ^ Council Regulation (EC) No 510/2006 on protected geographical indications and protected designations of origin: Stornoway Black Pudding 2007. ^ Application to register: Traditional Cumberland Sausage 2007. ^ EU protected food names scheme: protected designation of origin: Beacon Fell traditional Lancashire cheese 2014. ^ EU protected food names scheme: protected designation of origin: Bonchester Cheese 2007. ^ Product Specification: Buxton Blue 2007. ^ Product Specification: Dorset Blue Vinny Cheese 2007. ^ Product Specification: Dovedale Cheese 2007. ^ Product Specification: Exmoor Jersey Blue 2007. ^ Council Regulation (EC) No 510/2006 on protected geographical indications and protected designations of origin: Orkney Scottish Island Cheddar 2007. ^ Product Specification: Single Gloucester 2007. ^ EU protected food names scheme: protected designation of origin: Staffordshire Cheese 2007. ^ Product Specification: Swaledale Cheese 2007. ^ Product Specification: Stilton Cheese 2007. ^ Product Specification: Swaledale Ewes Cheese 2007. ^ Product Specification: Teviotdale cheese 2007. ^ Product Specification: West Country Farmhouse Cheddar 2007. ^ Product Specification: Yorkshire Wensleydale 2007. ^ Application for registration: Article 5: Cornish Clotted Cream 1998. ^ Council Regulation (EC) No 510/2006 on protected geographical indications and protected designations of origin:Armagh Bramley Apples 2007. ^ Council Regulation (EC) No 510/2006 on protected geographical indications and protected designations of origin: Fenland Celery 2007. 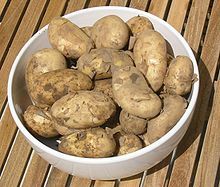 ^ Product Specification: Jersey Royal Potatoes 2007. ^ Council Regulation (EC) No 510/2006 on protected geographical indications and protected designations of origin: New Season Comber Potatoes/Comber Earlies 2007. ^ Council Regulation (EC) No 510/2006 on protected geographical indications and protected designations of origin:Pembrokeshire Earlies / Pembrokeshire Early Potatoes 2007. ^ Council Regulation (EC) No 510/2006 Application to register: Yorkshire Forced Rhubarb 2007. ^ EU protected food names scheme: protected geographical indication: Arbroath Smokies 2007. ^ Council Regulation (EC) No 510/2006 on Protected Geographical Indications and Protected Designations of Origin: Fal Oyster 2007. ^ Council Regulation (EC) No 510/2006 on Protected Geographical Indications and Protected Designations of Origin: Cornish Sardines 2007. ^ Council Regulation (EC) No 510/2006 on Protected Geographical Indications and Protected Designations of Origin: Isle of Man Queenies 2007. ^ Council Regulation (EC) No 510/2006 on protected geographical indications and protected designations of origin: Lough Neagh Eels 2007. ^ Council Regulation (EC) No 510/2006 on protected geographical indications and protected designations of origin: Scottish Farmed Salmon 2007. ^ Council Regulation (EC) No 510/2006 on protected geographical indications and protected designations of origin: Scottish Wild Salmon 2007. ^ Council Regulation (EC) No 510/2006: Traditional Grimsby Smoked Fish 2007. ^ Council Regulation (EC) No 510/2006 on protected geographical indications and protected designations of origin: West Wales Coracle Caught Salmon 2007. ^ Product Specification: Whitstable Oysters 2007. ^ Council Regulation (EC) No 510/2006 on protected geographical indications and protected designations of origin:Anglesey Sea Salt/Halen Môn 2014. ^ Council Regulation (EC) No 510/2006 on protected geographical indications and protected designations of origin: East Kent Goldings 2007. ^ Product Specification: Gloucestershire Cider 2007. ^ Product Specification: Gloucestershire Perry 2007. ^ Product Specification: Herefordshire Cider 2007. ^ Product Specification: Herefordshire Perry 2007. ^ Product Specification: Worcestershire Cider 2007. ^ Product Specification: Worcestershire Perry 2007. ^ Product Specification: Kentish Strong Ale 2007. ^ Product Specification: Kentish Ale 2007. ^ Product Specification: Rutland Bitter 2007. ^ Council Regulation (EC) No 510/2006 on Protected Geographical Indications and Protected Designations of Origin: Cornish Pasty 2007. ^ Council Regulation (EC) No 510/2006 on protected geographical indications and protected designations of origin: Native Shetland Wool 2007. ^ English wine - Protected designation of origin (PDO) 2007. ^ English regional wine - Protected designation of origin (PGI) 2007. ^ Welsh wine - Protected designation of origin (PDO) 2007. ^ Welsh regional wine - Protected designation of origin (PGI) 2007. ^ Delaere, Charles (5 November 2015). "Le whiskey irlandais a enfin son Indication géographique protégée". Retrieved 15 August 2017. ^ Regulation No 110/2008 of the European Parliament and of the Council 2008, p. 54. ^ a b Regulation No 110/2008 of the European Parliament and of the Council 2008, p. 29-30, 46. ^ Plymouth new bottle design 2011. ^ Regulation No 110/2008 of the European Parliament and of the Council 2008, p. 37, 46. ^ "INFRINGEMENT OF PROTECTED GEOGRAPHICAL INDICATIONS FOR WINE, SPIRITS, AGRICULTURAL PRODUCTS AND FOODSTUFFS IN THE EUROPEAN UNION" (PDF). Retrieved August 15, 2017. ^ Scotch Whisky verification 2014, p. 11. ^ "EUR-Lex - C2009/242/05 - EN - EUR-Lex". eur-lex.europa.eu. Retrieved 2017-01-23. ^ a b Barnard 2013, p. 186. Application to register: Traditional Cumberland Sausage (PDF). Department for Environment, Food and Rural Affairs. 2007. Retrieved 15 July 2014. Application to register: West Country Lamb (PDF). Department for Environment, Food and Rural Affairs. 2007. Retrieved 16 July 2014. Application to register: West Country Beef (PDF). Department for Environment, Food and Rural Affairs. 2007. Retrieved 16 July 2014. Application for registration: Article 5: Cornish Clotted Cream. Official Journal of the European Communities. 1998. Retrieved 15 July 2014. Application for registration of a TSG: Traditional farmfresh turkey (PDF). Department for Environment, Food and Rural Affairs. 2007. Retrieved 16 July 2014. Application for registration of a TSG: Traditionally Farmed Gloucestershire Old Spots Pork (PDF). Department for Environment, Food and Rural Affairs. 2007. Retrieved 16 July 2014. Brown, Catherine (2004). Traditional Foods of Britain: A Regional Inventory (2nd ed.). Devon, UK: Prospect Books. ISBN 9780907325871. Barnard, Catherine (2013) . The Substfantive Law of the EU: The Four Freedoms (4th ed.). Oxford, UK: Oxford University Press. ISBN 9780199670765. Council Regulation (EC) No 510/2006 Application to register: Yorkshire Forced Rhubarb (PDF). Department for Environment, Food and Rural Affairs. 2007. Retrieved 15 July 2014. Council Regulation (EC) No 510/2006: Melton Mowbray Pork Pie (PDF). Department for Environment, Food and Rural Affairs. 2007. Retrieved 15 July 2014. Council Regulation (EC) No 510/2006 on Protected Geographical Indications and Protected Designations of Origin: Anglesey Sea Salt/Halen Môn (PDF). Department for Environment, Food and Rural Affairs. 2014. Retrieved 15 July 2014. Council Regulation (EC) No 510/2006 on Protected Geographical Indications and Protected Designations of Origin:Armagh Bramley Apple (PDF). Department for Environment, Food and Rural Affairs. 2007. Retrieved 15 July 2014. Council Regulation (EC) No 510/2006 on Protected Geographical Indications and Protected Designations of Origin: Cornish Pasty (PDF). Department for Environment, Food and Rural Affairs. 2007. Retrieved 15 July 2014. Council Regulation (EC) No 510/2006 on Protected Geographical Indications and Protected Designations of Origin: Cornish Sardines (PDF). Department for Environment, Food and Rural Affairs. 2007. Retrieved 15 July 2014. Council Regulation (EC) No 510/2006 on Protected Geographical Indications and Protected Designations of Origin: East Kent Goldings (PDF). Department for Environment, Food and Rural Affairs. 2007. Retrieved 15 July 2014. Council Regulation (EC) No 510/2006 on Protected Geographical Indications and Protected Designations of Origin: Fal Oysters (PDF). Department for Environment, Food and Rural Affairs. 2007. Retrieved 15 July 2014. Council Regulation (EC) No 510/2006 on protected geographical indications and protected designations of origin: Fenland Celery (PDF). Department for Environment, Food and Rural Affairs. 2007. Retrieved 15 July 2014. Council Regulation (EC) No 510/2006 on Protected Geographical Indications and Protected Designations of Origin: Isle of Man Queenies (PDF). Department for Environment, Food and Rural Affairs. 2007. Retrieved 15 July 2014. Council Regulation (EC) No 510/2006 on protected geographical indications and protected designations of origin: Lakeland Herdwick (PDF). Department for Environment, Food and Rural Affairs. 2007. Retrieved 15 July 2014. Council Regulation (EC) No 510/2006 on protected geographical indications and protected designations of origin: Lough Neagh Eels (PDF). Department for Environment, Food and Rural Affairs. 2007. Retrieved 15 July 2014. Council Regulation (EC) No 510/2006 on Protected Geographical Indications and Protected Designations of Origin: Native Shetland Wool (PDF). Department for Environment, Food and Rural Affairs. 2007. Retrieved 15 July 2014. Council Regulation (EC) No 510/2006 on protected geographical indications and protected designations of origin: Newmarket Sausage (PDF). Department for Environment, Food and Rural Affairs. 2007. Retrieved 15 July 2014. Council Regulation (EC) No 510/2006 on protected geographical indications and protected designations of origin: New Season Comber Potatoes/Comber Earlies (PDF). Department for Environment, Food and Rural Affairs. 2007. Retrieved 15 July 2014. Council Regulation (EC) No 510/2006 on protected geographical indications and protected designations of origin: Orkney Scottish Island Cheddar (PDF). Department for Environment, Food and Rural Affairs. 2007. Retrieved 15 July 2014. Council Regulation (EC) No 510/2006 on protected geographical indications and protected designations of origin:Pembrokeshire Earlies / Pembrokeshire Early Potatoes (PDF). Department for Environment, Food and Rural Affairs. 2007. Retrieved 16 July 2014. Council Regulation (EC) No 510/2006 on protected geopgraphical [sic] indications and protected designations of origin: Scotch Beef (PDF). Department for Environment, Food and Rural Affairs. 2007. Retrieved 16 July 2014. Council Regulation (EC) No 510/2006 on protected geopgraphical [sic] indications and protected designations of origin: Scotch Lamb (PDF). Department for Environment, Food and Rural Affairs. 2007. Retrieved 16 July 2014. Council Regulation (EC) No 510/2006 on Protected Geographical Indications and Protected Designations of Origin: Scottish Farmed Salmon (PDF). Department for Environment, Food and Rural Affairs. 2007. Retrieved 15 July 2014. Council Regulation (EC) No 510/2006 on Protected Geographical Indications and Protected Designations of Origin: Scottish Wild Salmon (PDF). Department for Environment, Food and Rural Affairs. 2007. Retrieved 15 July 2014. Council Regulation (EC) No 510/2006 on protected geographical indications and protected designations of origin: Stornoway Black Pudding (PDF). Department for Environment, Food and Rural Affairs. 2007. Retrieved 15 July 2014. Council Regulation (EC) No 510/2006 on protected geographical indications and protected designations of origin: Welsh Lamb (PDF). Department for Environment, Food and Rural Affairs. 2007. Retrieved 16 July 2014. Council Regulation (EC) No 510/2006 on protected geographical indications and protected designations of origin: West Wales Coracle Caught Salmon (PDF). Department for Environment, Food and Rural Affairs. 2007. Retrieved 15 July 2014. Council Regulation (EEC) No 2081/92: Isle of Man Manx Loaghtan Lamb (PDF). Department for Environment, Food and Rural Affairs. 2007. Retrieved 16 July 2014. Regulation (EC) No 510/2006: Traditional Grimsby Smoked Fish (PDF). Department for Environment, Food and Rural Affairs. 2007. Retrieved 15 July 2014. "Database of Origin and Registration". European Commission. n.d. Retrieved 16 July 2014. "E-Bacchus". European Commission. n.d. Retrieved 16 July 2014. English wine — Protected designation of origin (PDO) (PDF). Department for Environment, Food and Rural Affairs. 2007. Retrieved 16 July 2014. English regional wine — Protected designation of origin (PGI) (PDF). Department for Environment, Food and Rural Affairs. 2007. Retrieved 16 July 2014. EU protected food names scheme: protected geographical indication: Arbroath Smokies (PDF). Department for Environment, Food and Rural Affairs. 2007. Retrieved 15 July 2014. EU protected food names scheme: protected designation of origin: Bonchester Cheese (PDF). Department for Environment, Food and Rural Affairs. 2007. Retrieved 15 July 2014. EU protected food names scheme: protected designation of origin: Beacon Fell traditional Lancashire cheese (PDF). Department for Environment, Food and Rural Affairs. 2014. Retrieved 15 July 2014. EU protected food names scheme: protected designation of origin: Staffordshire Cheese (PDF). Department for Environment, Food and Rural Affairs. 2007. Retrieved 15 July 2014. "EU agricultural product quality policy". European Commission. 2014. Retrieved 15 July 2014. "Geographical indications and traditional specialities". European Commission. 2014. Retrieved 15 July 2014. "New framework for Quality schemes in agriculture enters into force". European Commission. 2013. Retrieved 15 July 2014. Plymouth new bottle design. Black Friars Distillery. 2011. Retrieved 17 July 2014. Product Specification: Buxton Blue (PDF). Department for Environment, Food and Rural Affairs. 2007. Retrieved 15 July 2014. Product Specification: Dorset Blue Vinny Cheese (PDF). Department for Environment, Food and Rural Affairs. 2007. Retrieved 15 July 2014. Product Specification: Dovedale Cheese (PDF). Department for Environment, Food and Rural Affairs. 2007. Retrieved 15 July 2014. Product Specification: Exmoor Jersey Blue (PDF). Department for Environment, Food and Rural Affairs. 2007. Retrieved 15 July 2014. Product Specification: Gloucestershire Cider (PDF). Department for Environment, Food and Rural Affairs. 2007. Retrieved 15 July 2014. Product Specification: Gloucestershire Perry (PDF). Department for Environment, Food and Rural Affairs. 2007. Retrieved 15 July 2014. Product Specification: Herefordshire Cider (PDF). Department for Environment, Food and Rural Affairs. 2007. Retrieved 15 July 2014. Product Specification: Herefordshire Perry (PDF). Department for Environment, Food and Rural Affairs. 2007. Retrieved 15 July 2014. Product Specification: Jersey Royal Potatoes (PDF). Department for Environment, Food and Rural Affairs. 2007. Retrieved 15 July 2014. Product Specification: Kentish Ale (PDF). Department for Environment, Food and Rural Affairs. 2007. Retrieved 15 July 2014. Product Specification: Kentish Strong Ale (PDF). Department for Environment, Food and Rural Affairs. 2007. Retrieved 15 July 2014. Product Specification: Orkney Beef (PDF). Department for Environment, Food and Rural Affairs. 2007. Retrieved 16 July 2014. Product Specification: Orkney Lamb (PDF). Department for Environment, Food and Rural Affairs. 2007. Retrieved 16 July 2014. Product Specification: Rutland Bitter (PDF). Department for Environment, Food and Rural Affairs. 2007. Retrieved 15 July 2014. Product Specification: Shetland Lamb (PDF). Department for Environment, Food and Rural Affairs. 2007. Retrieved 16 July 2014. Product Specification: Single Gloucester (PDF). Department for Environment, Food and Rural Affairs. 2007. Retrieved 15 July 2014. Product Specification: Stilton Cheese (PDF). Department for Environment, Food and Rural Affairs. 2007. Retrieved 16 July 2014. Product Specification: Swaledale Cheese (PDF). Department for Environment, Food and Rural Affairs. 2007. Retrieved 16 July 2014. Product Specification: Swaledale Ewes Cheese (PDF). Department for Environment, Food and Rural Affairs. 2007. Retrieved 16 July 2014. Product Specification: Teviotdale Cheese (PDF). Department for Environment, Food and Rural Affairs. 2007. Retrieved 16 July 2014. Product Specification: Welsh Beef (PDF). Department for Environment, Food and Rural Affairs. 2007. Retrieved 15 July 2014. Product Specification: West Country Farmhouse Cheddar (PDF). Department for Environment, Food and Rural Affairs. 2007. Retrieved 16 July 2014. Product Specification: Whitstable Oysters (PDF). Department for Environment, Food and Rural Affairs. 2007. Retrieved 15 July 2014. Product Specification: Worcestershire Cider (PDF). Department for Environment, Food and Rural Affairs. 2007. Retrieved 15 July 2014. Product Specification: Worcestershire Perry (PDF). Department for Environment, Food and Rural Affairs. 2007. Retrieved 15 July 2014. Product Specification: Yorkshire Wensleydale (PDF). Department for Environment, Food and Rural Affairs. 2007. Retrieved 15 July 2014. Regulation No 110/2008 of the European Parliament and of the Council:. Official Journal of the European Union. 13 February 2008. Retrieved 17 July 2014. "Protected food names: guidance for producers". Department for Environment, Food and Rural Affairs. 2014. Retrieved 15 July 2014. Scotch Whisky verification (PDF). Spirit Drinks Verification Scheme — technical guidance. HMRC. January 2014. Retrieved 17 July 2014. Welsh wine — Protected designation of origin (PDO) (PDF). Department for Environment, Food and Rural Affairs. 2007. Retrieved 16 July 2014. Welsh regional wine — Protected designation of origin (PGI) (PDF). Department for Environment, Food and Rural Affairs. 2007. Retrieved 16 July 2014. This page was last edited on 5 March 2019, at 13:00 (UTC).